TOLEDO, Ohio -- From street lamps and sidewalks to storm drains and sewers, civil engineering projects designed to be environmentally friendly are under way in communities across the United States. The city of Toledo, Ohio, in a pilot project, is adopting so-called "green infrastructure" techniques to alleviate storm water run-off and to reduce basement flooding in residential areas. Jeanette Stinson has lived on Maywood Avenue, a lower income neighborhood on the north side of Toledo, for 58 years. She’s seen a lot of changes in that time, but says some of the best have come in the last year and a half. With money from the federal government, the city transformed the existing grassy areas between the sidewalk and street into a natural storm water drainage system, and landscaped it with native plants, flowers, and shrubs. Stinson added some of her own perennials. These new areas, or bioswales, as they’re known, are actually designed for floods, not flowers. Before they were put in, most of the basements on Maywood would flood whenever the city experienced a heavy rainfall. That caused sewers to back up, sometimes spilling raw sewage into the area rivers. Engineer Andy Langenderfer worked on the project to slow the runoff by diverting it into the bioswales. "We dug out the existing [area] behind the curb, which used to drain from behind the sidewalk, over the curb and then it would go directly into the storm sewer. Now we’re taking off all that direct runoff to the storm sewer. " 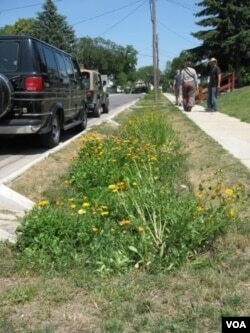 To create a bioswale, they dug a shallow ditch, then filled it with layers of gravel and soil that permit rainfall to drain into the ground instead of overflowing into the sewers. These strips were planted with grasses and deep-rooted groundcover to further aid absorption. New sidewalks and driveways were built behind the bioswales with a water-permeable type of concrete that also slowed run-off. Coordinators chose Maywood Avenue because there was already a community garden on the street, so they believed the neighbors would embrace the project. But, resident Jonathan White remembers being uncertain about the project when the organizers went door to door to explain the plan. "I really wasn’t sure about it. I didn’t know, they were talking about digging water gardens and all that and I wasn’t sure about digging in my yard," he says. "Then we came out and saw that and I was like, I’m not sure about that either. But it worked out. I like it." Shortly after the project was completed, Toledo got its first big storm. The bioswales on Maywood Avenue absorbed the rainwater, while houses just one street over were flooded. Andy Langenderfer says that proved the project did what it was designed to do. "We’ve seen actual 60-70 percent reduction in volume and the peak runoff during large rain events." For Lynette Hablitzel, with the Ohio Environmental Protection Agency, what’s happening on Maywood Avenue is a great model for other green infrastructure projects. "What we really love about this project is that they are monitoring the runoff," she says. "They have a control neighborhood, which has no changes, they have this neighborhood which had a lot of changes made and they are monitoring for both the flow rate, the volume that comes off this neighborhood as well as pollutant removal." Planners can take the information and apply it to other watersheds with flooding issues - from other Toledo neighborhoods, to communities across the United States, and cities around the world. London has just put in a bioswale at the 2012 Olympic Park. Back on Maywood Avenue, residents are getting used to the new landscape, which requires little maintenance other than weeding and mulching now and then, and of course some water for the plants during dry spells. While Jeanette Stinson is happy with the change, she says it does have one drawback, which she thinks engineers should consider for future projects. "I don’t like it when cars pull up to the curb," she says. "There’s really no place for anybody to walk and then sometimes they fall in the ditch or step too far back in the ditch." Still, she agrees an occasional misstep is much better than flooded basements or raw sewage in the river.